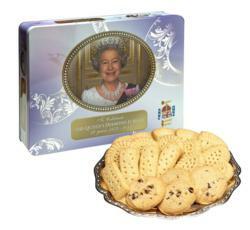 Walkers Shortbread releases Queen's Diamond Jubilee Collector's Tin. Walkers Shortbread celebrates The Queen’s Diamond Jubilee, which marks Her Majesty’s sixty-year reign, with the launch of a 15.8 oz commemorative tin. The Queen’s Diamond Jubilee Tin is adorned with a lovely image of Her Majesty and incorporates her Diamond Jubilee emblem, which was designed by ten-year-old Katherine Dewar from Chester, England. Dewar’s colorful design was chosen from nearly 35,000 entries submitted by children ages six through fourteen to a design competition hosted by Buckingham Palace and the BBC’s Blue Peter program. The selection of Walkers’ famous shortbread cookies inside the tin is sure to delight collectors and connoisseurs alike with its variety of all-natural shortbread cookies, including ten triangle shortbread cookies, five shortbread rounds, five oval shortbread cookies, three shortbread fingers and four chocolate chip shortbread cookies. The Queen came to the throne on February 6, 1952 and her coronation took place on June 2, 1952. She celebrated her Silver Jubilee (25 years) in 1977 and her Golden Jubilee (50 years) in 2002. Diamond Jubilee celebrations are planned throughout the United Kingdom, including a River Pageant on the Thames, a concert at Buckingham Palace and the lighting of 2012 beacons throughout the United Kingdom and the Commonwealth. The only other British monarch to celebrate a Diamond Jubilee was Queen Victoria in 1897. The third and fourth generations of the Walkers family manage all activities at the Walkers Shortbread bakery in the Scottish Highlands, which for 114 years has produced the best shortbread in the world. Walkers’ cookies and biscuits are made using only the finest ingredients and contain no artificial flavorings, colors or additives of any kind. The shortbread is suitable for vegetarians and certified kosher OUD. To learn more, visit http://www.walkersus.com.